What this report finds: Income inequality in the United States is suppressing growth in aggregate demand (spending by households, businesses, and governments) by shifting an ever larger share of income to rich households that save rather than spend. This rise in inequality has been overwhelmingly driven by the failure of pay for typical American workers to keep pace with economy-wide productivity growth. EPI estimates that rising inequality has slowed growth in aggregate demand by 2 to 4 percentage points of GDP annually in recent years. Why it matters: For decades, the drag on demand growth stemming from rising inequality has been compensated for by other economic and policy developments—notably a long-running decline in interest rates. Going forward, however, these compensating mechanisms are likely to fail, which means that the inequality-induced drag on demand would translate directly into slower economic growth overall. What we can do about it: In the near term, we need more expansionary macroeconomic policies—lower interest rates and larger budget deficits—to counter the downward pressure on demand. In the longer run, we need to stop or reverse rising inequality by enacting policies that spur faster wage growth for low- and middle-wage workers. Raising these workers’ wages would not only raise living standards for American families, it would also ensure robust economic growth. Income inequality in the United States has risen dramatically since the late 1970s, and the issue has drawn heightened attention in recent years. In the past decade, economic observers have also become increasingly worried about “secular stagnation”—or a chronic shortfall of aggregate demand, fearing that this shortfall will constrain American economic growth in coming years. These two phenomena—rising inequality and chronic weakness of demand—are related. Specifically, rising inequality transfers income from low-saving households in the bottom and middle of the income distribution to higher-saving households at the top. All else equal, this redistribution away from low- to high-saving households reduces consumption spending, which drags on demand growth. A stunningly large upward redistribution of income has characterized the American economy in recent decades. In 1979, the bottom 90 percent of American households claimed roughly 70 percent of total income in the U.S. economy. By 2016, this share had fallen to around 60 percent. By far the most important driver of this upward redistribution is the growing wedge between economy-wide productivity growth (a measure of income generated in an average hour of work in the United States) and hourly pay of typical American workers since the mid-1970s. Had these two measures grown together the way they did in earlier eras, there would have been no possibility of upward income redistribution. The demand drag imposed each year by rising inequality is equivalent to the peak boost to economic demand provided (in 2010) by the American Recovery and Reinvestment Act (ARRA, the stimulus package passed in the first months of the Obama administration). Essentially to offset the hit to demand posed by rising inequality, we’d need to enact a policy each and every year that delivers a boost of the rough magnitude of the peak ARRA boost. One puzzle that arises in the causal chain linking rising inequality to slower demand growth is that the personal savings rate measured in the National Income and Product Accounts (NIPA) has actually declined, not risen over recent decades. However, a closer analysis of the data and economics behind savings behavior shows that the declining savings rate measured conventionally in the NIPAs does not capture many ways in which savings of high-income households have increased. The most important fact is that unrealized capital gains spurred by corporate stock buybacks are not captured in the NIPA personal savings measure. However, these unrealized gains do constitute large increases in wealth (which is a form of savings) for shareholders. This new attention to the crisis of American pay is totally proper. The failure of wages of the vast majority of Americans to benefit from economy-wide growth in productivity (or income generated in an average hour of work) has been the root cause of the stratospheric rise in inequality and the concentration of economic growth at the very top of the income distribution. Had this upward redistribution not happened, incomes for the bottom 90 percent of Americans would be roughly 20 percent higher today.3 In short, the rise in inequality driven by anemic wage growth has imposed an “inequality tax” on American households that has robbed them of a fifth of their potential income. There would be huge benefits to American well-being from blocking or reversing this upward redistribution. This welfare gain stemming from blocking upward redistribution is the primary reason to champion policy measures to boost wage growth and lead to a more equal distribution of income gains. Put simply, a dollar is worth more to a family living paycheck to paycheck than it is to families comfortably in the top 1 percent of the income distribution. Proponents of increases in the minimum wage and other measures to boost American wages have often argued that there are benefits to these policies besides the welfare gains stemming from pure redistribution. These proponents have often argued that boosting wages would even benefit aggregate economic outcomes, like growth in gross domestic product (GDP) or employment. Recent evidence about developments in the American and global economies strongly indicate that these arguments are correct: boosting wages of the bottom 90 percent would not just raise these households’ incomes and welfare (a more-than-sufficient reason to do so), it would also boost overall growth. For the past decade (and maybe even longer), the primary constraint on American economic growth has been too-slow spending by households, businesses, and governments. In economists’ jargon, the constraint has been growth in aggregate demand lagging behind growth in the economy’s productive capacity (including growth of the labor force and the stock of productive capital, such as plants and equipment). Much research indicates that this shortfall of demand could become a chronic problem in the future, constantly pulling down growth unless macroeconomic policy changes dramatically. The first block of columns simply shows the top 1 percent share of overall household income and of various income types as identified in CBO (2016). A clear finding is that the top 1 percent share of every source of income except government transfers rose significantly between 1979 and 2007. The share of overall income held by the top 1 percent more than doubles (rising from 8.9 to 18.7 percent of total income) between 1979 and 2007. And even with the enormous blow to top 1 percent incomes dealt by the 40 percent loss in the stock market from 2007 to 2010, the top 1 percent share in 2012 of 17.3 percent was almost double its 1979 level. Particularly salient to this analysis is the rough doubling of both labor and total capital shares claimed by the top 1 percent from 1979 to 2007 and 2012. The next block of columns shows each income category’s share of overall household income. The most striking finding here is the large decline in the labor compensation share of total income, falling from 70.6 percent in 1979 to 61.0 percent in 2007 and 2012. Correspondingly, the share of total capital and business income (driven by capital gains and business income) rose substantially, from 17.5 percent in 1979 to 22.1 percent in 2007.5 Due to the stock market crash in 2007 and the hangover from that crash through 2010, capital income shares (and thus total capital and business income) remained lower in 2012 than in 2007, but still above the 1979 levels. Finally, pension payments and transfer incomes have risen steadily over time as shares of total income. The third block of columns calculates how much growing concentration within each income category contributed to the increasing top 1 percent share of income from 1979 to 2007 and from 1979 to 2012. The growing concentration of particular income types in the top 1 percent of households contributed 7.2 percentage points to the 9.8 percentage-point increase in the top 1 percent’s income share from 1979 to 2007, accounting for essentially three quarters of the rise. The vast majority of this concentration within income sources is accounted for by labor and capital incomes. The last block of columns summarizes how much the shift from less-concentrated (labor) income to more-concentrated (capital) incomes boosted the top 1 percent share of overall household income. The sum of these shifts contributed 2.6 percentage points to the growth of the top 1 percent share from 1979 to 2007, and 0.4 percentage points from 2007 to 2012. One way to summarize what these data tell us is that the vast majority of households (those outside the top 1 percent) are losing out in claiming their proportionate share of total income growth in two significant ways. First, workers as a group are losing out to capital owners, with the shift from labor to capital income explaining a significant portion of the rise of the top 1 percent. Second, the bottom 99 percent of income earners in America are able to claim only an ever-shrinking portion of the overall wage bill, with the highest-paid workers in the top 1 percent more than doubling their share of labor income over the last three and a half decades. 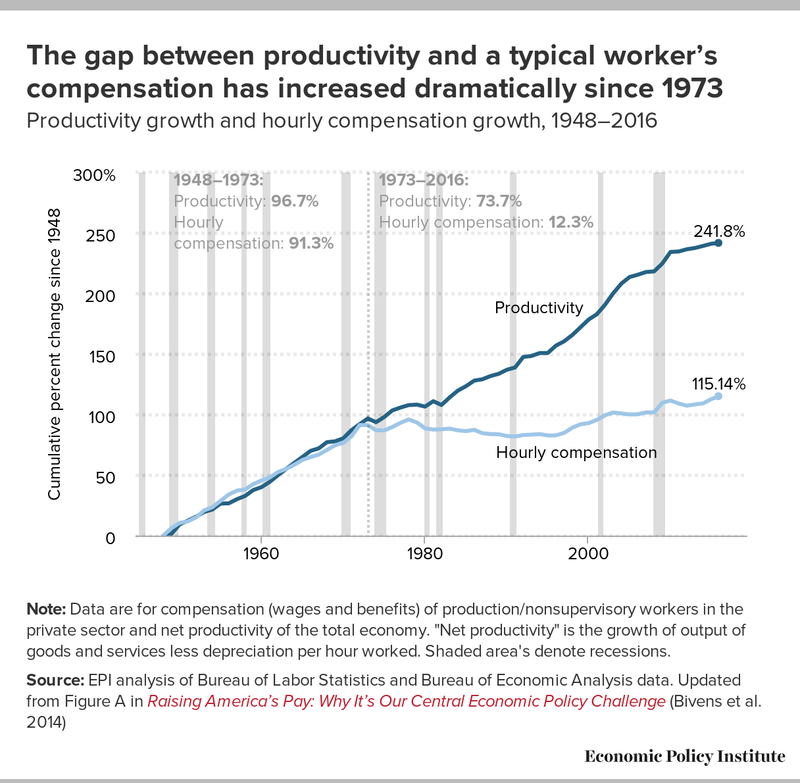 But wages for the vast majority of workers stopped keeping pace with economy-wide productivity growth in the late 1970s, and the cumulative wedge between productivity and typical workers’ pay has risen ever since, as shown below in Figure A. This figure shows growth in economy-wide productivity, defined as the amount of income and output generated in an average hour of work in the economy. While the pace of productivity growth slowed down in the late 1970s, productivity still grew steadily in the following decades. The figure also shows a measure of hourly pay (including both wages and benefits) for production and nonsupervisory workers in the U.S. economy. This nonmanagerial group includes roughly 80 percent of the private-sector workforce. After growing right in line with productivity for decades following World War II, hourly pay for these workers all but stagnated after 1979. Because productivity kept growing but pay for 80 percent of the private-sector workforce stagnated, this means that the economy continued to generate growing incomes on average each year, but pay for typical workers slowed radically. In short, the growing wedge between these lines represents the disproportionate share of economic growth claimed by those at the top after 1979. Note: Data are for compensation (wages and benefits) of production/nonsupervisory workers in the private sector and net productivity of the total economy. "Net productivity" is the growth of output of goods and services less depreciation per hour worked. Shaded area's denote recessions. Updated from: Figure A in Raising America’s Pay: Why It’s Our Central Economic Policy Challenge, by Josh Bivens, Elise Gould, Lawrence Mishel, and Heidi Shierholz, Economic Policy Institute, 2014. Table 1 and Figure A together tell a clear story about the rise in American inequality: it has been made possible by the suppression of wage growth for the vast majority of American workers. Until this wage suppression ends and hourly pay for the vast majority of workers begins rising in lockstep with economy-wide productivity, there is very little reason to hope that rising inequality can be arrested. This makes focusing policy attention on boosting wage growth absolutely crucial. A useful (if admittedly too-simple) way to think about an economy’s growth is as an interplay between the economy’s productive capacity and the level of aggregate demand. The economy’s productive capacity is a measure of potential that includes three major “inputs” of production: the labor force, the capital stock, and the state of technology. However, for these potential inputs to be fully utilized, aggregate demand—or spending by households, businesses, and governments—must be strong enough to mobilize them. Take the example of a hotel’s economic fortunes from 2007 to 2010. In 2007, the building and physical plant existed, the systems for taking reservations existed, and there were plenty of workers, both actual employees and potential workers willing to take jobs at the right wages. Also in that year, there were customers; rooms were likely booked to capacity and the owners may have even considered adding rooms. In 2010, this hotel still had a physical plant and reservation systems, and while their own staff was likely much smaller because of layoffs in the wake of the Great Recession, there was a huge increase in potential workers looking for jobs that could have been hired. But what kept the hotel’s hiring constrained and profits low in 2010 was lack of customers, not slow growth in the economy’s potential (or productive capacity). Recently, a number of economists have noted that evidence over recent decades indicates that growth has been constrained more by slow growth in aggregate demand than by slow growth in the economy’s productive capacity. For example, the full business cycle between the peaks of 2001 and 2007 saw the slowest economic growth then on record. The result of this slow growth was that the unemployment rate never returned to prerecession levels, and the prime-age employment-to-population (EPOP) ratio never approached prerecession levels. (See Bivens and Irons 2008 for a full accounting of this business cycle’s place in historical comparisons.) All of this indicates that the slow growth that took hold even before the Great Recession hit was likely a function of too-slow growth in aggregate demand—or spending by households, businesses, and governments. 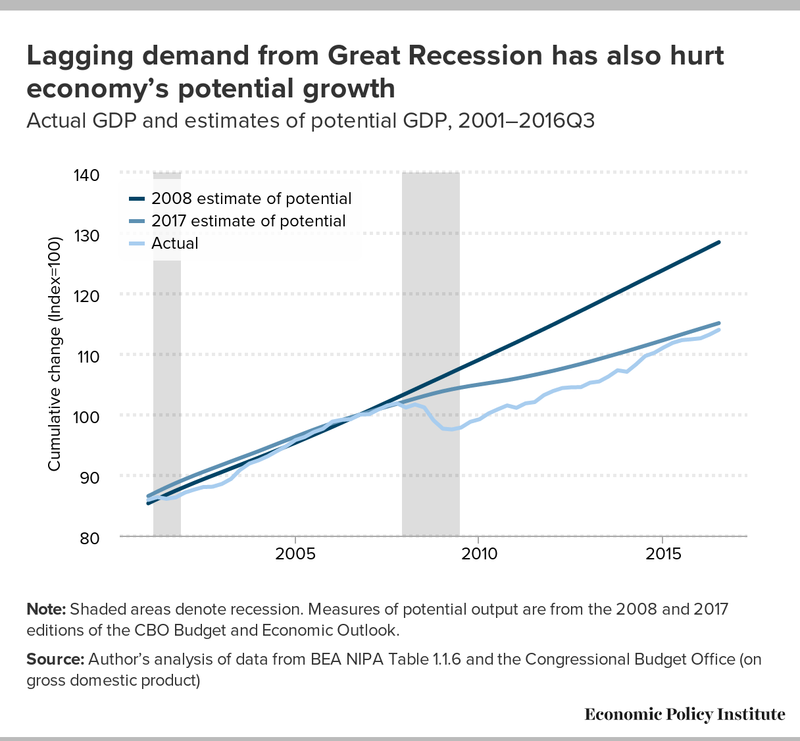 Before the Great Recession, most macroeconomists would have rejected the idea that economic growth could be constrained for long periods of time by too-slow demand growth relative to the economy’s productive capacity. The typical view was that growth in productive capacity was driven by long-run trends that did not change very fast, such as the aging of the population (which determines the pace of potential labor force growth), the accumulation of plants, equipment, and buildings that is the result of decades of past investment, and accelerations and decelerations of technology that were largely exogenous (unrelated to the state of the business cycle). In this view, ensuring that growth in productive capacity (or growth in potential GDP) is fully realized essentially means ensuring that aggregate demand grows quickly enough to keep resources (labor and capital) fully employed. 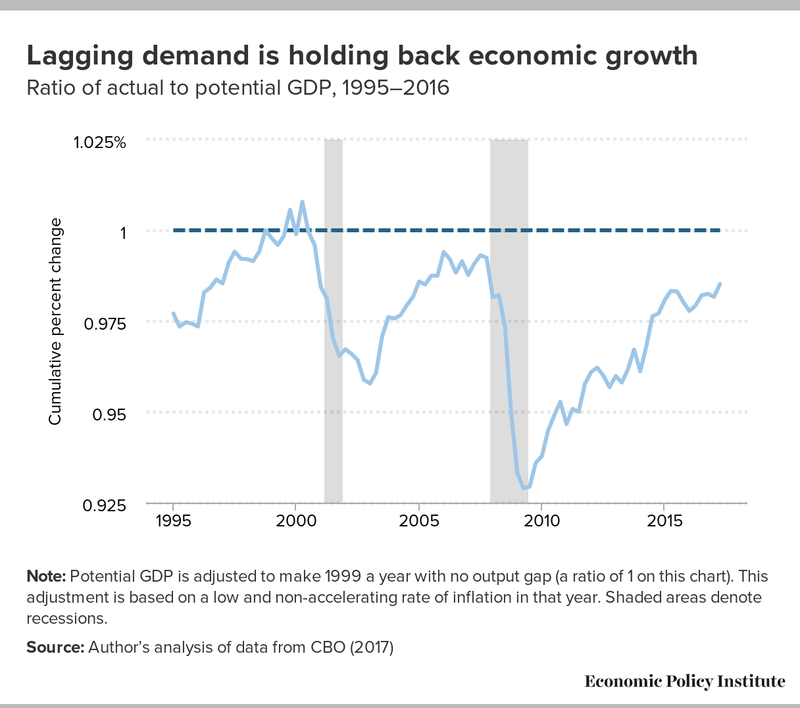 In past decades, policymakers considered it relatively easy to keep aggregate demand growing fast enough high enough to fully utilize the economy’s productive capacity. In fact, macroeconomic policymakers thought their most difficult task was restraining, not boosting, growth in aggregate demand. When aggregate demand for economic output outstrips the economy’s productive capacity to meet that demand, the result is inflation. So policymakers focused on controlling inflation—or ensuring that aggregate demand did not run chronically too fast. Of course, the U.S. economy underwent recessions during which demand growth lagged behind potential GDP growth, but it was thought that the demand shortfalls could be easily solved by the Federal Reserve reducing short-term interest rates to spur more spending. Because aggregate demand was thought to need policy restraint, not stimulus, this implies that overall growth was constrained by how fast the economy’s productive capacity could grow. Any worry that persistently slow growth (say lasting more than one year) in aggregate demand could be a primary constraint on economic growth over a meaningfully long time period was largely dismissed. We now know that this dismissal was premature, and that sluggish demand growth can pull down economic growth for long periods of time. The data show we are in such a period, and likely have been for over a decade. The extraordinarily weak GDP growth between 2001 and 2007 was accompanied by decelerating wage growth, and low inflation and interest rates. These trends are strong indicators that demand was lagging growth in productive capacity. This weakness in demand was especially striking given that aggregate demand (or spending by households, businesses, and governments) was buoyed in those years initially by near-zero interest rates (set by the Federal Reserve in the early 2000s) and then by an enormous asset bubble in residential real estate that increased household wealth in the mid-2000s. The housing bubble burst, ushering in the Great Recession. The recovery from that recession was even slower than the recovery from the 2001 recession, despite extraordinarily expansionary monetary policy in the wake of the Great Recession. Figure B shows the ratio of actual GDP to potential GDP since 1995. When this ratio is below 1, there is prima facie evidence that aggregate demand is constraining economic growth. As the figure shows, this ratio has been well below 1 for most of the past two decades, even as monetary policy has been historically expansionary. Note: Potential GDP is adjusted to make 1999 a year with no output gap (a ratio of 1 on this chart). This adjustment is based on a low and non-accelerating rate of inflation in that year. Shaded areas denote recessions. Aggregate demand growth has lagged growth in the economy’s productive capacity over much of the last two decades even as growth in this productive capacity itself slowed sharply. Crucially, there is ample evidence that the degraded growth in potential output is itself another casualty of too-slack demand. It is now well-known that changes in productive capacity (i.e., the supply side of the economy) are likely affected by changes in the demand-side of the economy. The most obvious example concerns capital investment. When demand is weak, customers disappear and workers’ wages don’t grow as fast, or grow at all, as rising unemployment crushes workers’ bargaining power. A shortage of customers and weak wage growth blunts the incentive of firms to invest in plants or equipment to expand capacity or save on labor costs. This in turn slows the growth of the economy’s capital stock, a key input in its productive capacity. Short recessions will leave only a small scar on an economy’s productive capacity, but there is now ample evidence that longer and steeper recessions can do serious damage to even the economy’s potential, let alone actual, growth. We have clearly seen this dynamic over the past decade.7 Growth in potential GDP has been so much slower than growth that was projected in 2008 for the next decade that forecasters by 2017 have essentially erased $2 trillion annually in potential output from the American economy, as shown in Figure C.
Note: Shaded areas denote recession. Measures of potential output are from the 2008 and 2017 editions of the CBO Budget and Economic Outlook. The relationship between a chronic shortage of aggregate demand (secular stagnation) and the fall in the economy’s “neutral” interest rate is straightforward. A decline in aggregate demand growth that is exogenous to interest rates will generally spur the Federal Reserve to reduce interest rates in order to stimulate consumption and investment and keep the economy at full employment. Hence, the interest rate consistent with the economy reaching full employment (the neutral rate) will fall over time if this exogenous drag on demand growth continues or worsens. The evidence that this neutral rate has declined over time is compelling. 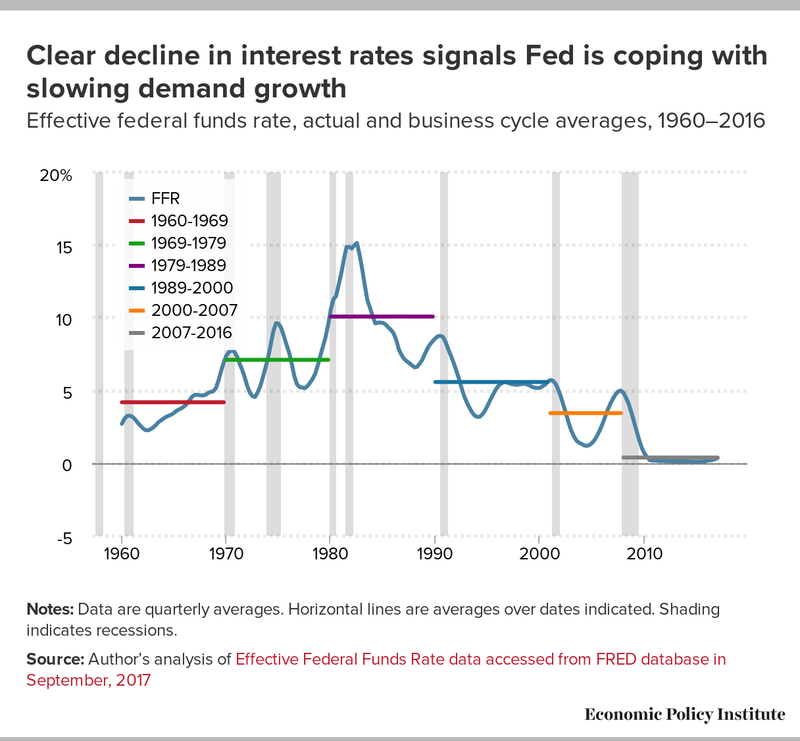 Figure D shows the federal funds rate (FFR) as well as showing its average value over recent business cycles. The evidence that the neutral FFR rate has been steadily falling since the 1980s seems quite clear. Notes: Data are quarterly averages. Horizontal lines are averages over dates indicated. Shading indicates recessions. There is a relatively straightforward causal link between the rise of inequality and the chronic shortfall of aggregate demand: higher-income households have much higher savings rates than low- and middle-income households. So, as a dollar is transferred from the bottom and middle to the top of the income distribution, less of it is spent. When the economy is functioning well, reduced consumer spending is offset by increased investment in plants and equipment, and demand is hence unaffected. Here is how it could work. The reduced consumption stemming from this redistribution translates mechanically into higher savings. Higher savings in turn puts downward pressure on interest rates, and these lower interest rates induce more business investment in plants and equipment. This interest rate adjustment hence ensures that the reduced consumption spending that follows the upward redistribution of income is matched by an increase in investment spending, and hence does not constitute a drag on growth in aggregate demand. Keeping demand growth constant in the face of upward redistribution of income requires ever-lower interest rates, consistent with the data highlighted above. But if this neutral rate falls far enough, the economy’s ability to seamlessly translate lower consumption (or higher savings) into higher investment spending will be potentially blocked by the zero lower bound (ZLB) on interest rates. Interest rates cannot be moved below zero (or at least not too much below zero) for extended periods of time because negative interest rates will just induce households to hold their wealth in cash rather than interest-bearing (or interest-subtracting!) bonds. With the economy’s ability to translate additional savings into higher investment blocked at the ZLB, further increases in savings will instead show up as unused capacity and output losses rather than interest rates reductions. Figure D showed that the U.S. economy has spent most of the post-2001 period hovering perilously close to the ZLB, so it is valid to fear that increases in inequality have dragged on growth and will continue to drag on growth. How much is inequality sapping demand? The previous section noted that rising inequality will, all else equal, slow demand growth, as income is transferred to higher-savings households at the top of the income distribution. The empirical question is just how much rising inequality has contributed to the decline in aggregate demand growth. Again, this decline in demand growth will show up in data as either a slowdown in overall growth, or a pronounced decline in the neutral interest rate. Rachel and Smith (2015), using a variety of techniques, estimate that the rise in inequality in recent decades will likely depress global interest rates by up to 0.6 percent in coming decades, making its importance on par with any other single influence they survey. They also note that while the global interest rate is important, country-specific rates can diverge from global rates due to country-specific factors. Given that the U.S. economy has seen a larger concentration of income at the top of the distribution than have other advanced countries, the effect of inequality on the pace of aggregate demand growth (and hence interest rates) is likely larger as well. Cynamon and Fazzari (2015) assemble a range of indicators estimating the potential of both rising inequality and rising household debt to act as a brake on demand growth. They highlight the role of rising household debt as a buffer that kept consumption for the bottom 95 percent of households from falling in the face of relatively slow income growth in the pre-Great Recession period. This buffer was annihilated by the wealth lost when the housing bubble burst and ushered in the Great Recession in 2008. Cynamon and Fazzari (2015) argue that the decaying effect on demand of the transfer to the top, combined with the removal of the debt-consumption buffer, can largely explain the slow recovery from the Great Recession. These findings are largely buttressed by Alichi, Kantenga, and Sole (2016), who use a regression-based framework to estimate that changes in the American income distribution since 1998 had led to a demand-drag of more than 1 percent of total U.S. GDP by 2013. Notes: Construction of the data is described in the appendix. For each group’s income, we again use data on comprehensive household income from the Congressional Budget Office (2016). Unlike Cynamon and Fazzari (2015), we include government transfers in our estimate of household income. This income provides purchasing power to households, and this purchasing power absolutely informs households’ consumption decisions and savings rates. Excluding these transfers from household income gives an estimate of how market-based income trends by themselves would have affected aggregate demand growth. Including the transfers provides an estimate of how much shifting inequality overall (even including the generally equalizing effect of taxes and transfers) actually slowed aggregate demand growth in recent decades. The point of Figure E is simply that savings rates vary enormously across the income distribution. 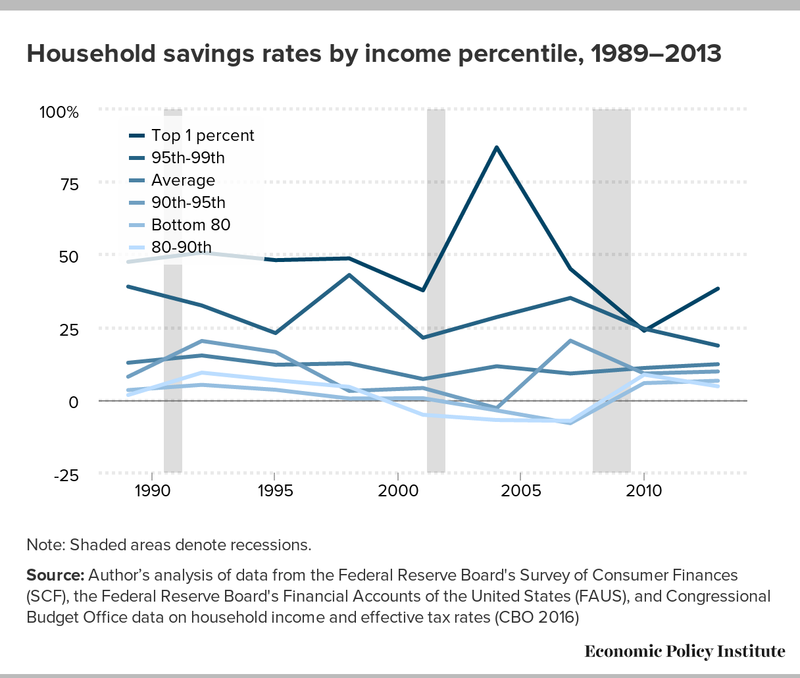 The economy-wide savings rate averaged 11.6 percent from 1989 to 2013, while the savings rate for the top 1 percent averaged 47.4 percent. This large difference in savings rates gives rising inequality a very long lever with which to influence trends in aggregate demand growth. A straightforward back-of-the-envelope estimate of how much the redistribution of income toward the top stifled consumption growth involves multiplying each group’s share of income in earlier years by its savings rate and sum across groups, repeating this procedure for later years, and then simply subtracting the later aggregates from the earlier aggregates. Table 2 shows the results of this procedure. Notes: Income shares do not sum to 100 percent because the CBO income data includes households with negative incomes. 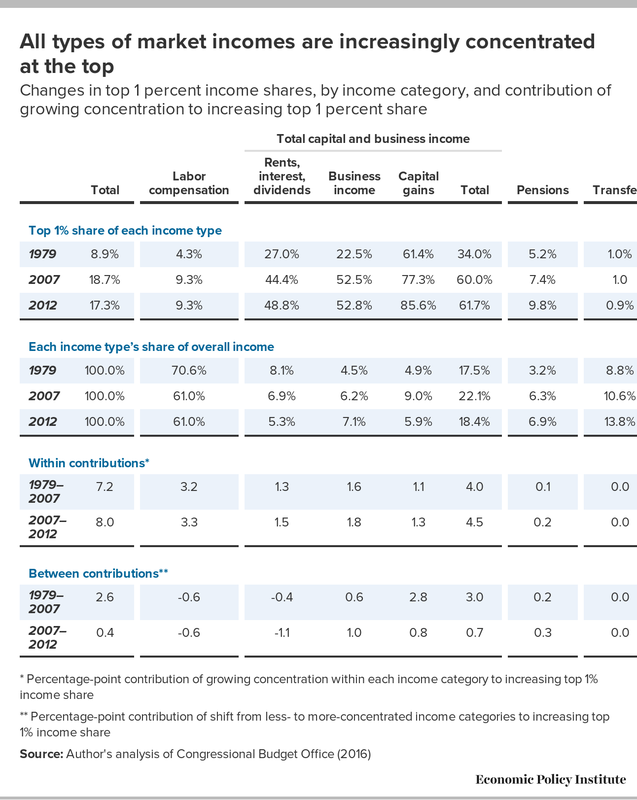 The shares in the table above are effectively income shares of households with positive income. Negative income is never more than 2 percent of total income, so this failure to round to 100 has only trivial effects on our calculations. The change in aggregate demand is calculated as the change in income multiplied by one minus the savings rate (essentially each income group’s average propensity to consume). The top panel of Table 2 shows the average savings rate for each of the income groups featured in Figure E.11 In the middle panel of the table are estimates of the change in income share of each income group for three overlapping periods: 1979–2007, 1989–2007, and 1979–2012. Between 1989 and 2007, the share of income claimed by the 95th to 99th percentile of households and the top 1 percent of households rose by 0.6 percent and 6.5 percent, respectively. Multiplying each group’s change in income share over this period by their average savings rate implies that aggregate consumption spending fell by 3.1 percentage points from 1989 to 2007 due to the redistribution of income upward, holding all other influences constant. This figure is found in the bottom panel, which shows the demand drag potentially caused by rising inequality for the three periods. While data restrictions keep us from getting average savings rates going back to 1979 (as the SCF does not have reliable data before 1989), there was a large redistribution between 1979 and 1989 as well. The implied demand drag of the 1979–2007 and 1979–2012 periods assumes that average savings rates across income percentiles from 1989 to 2013 characterize these periods as well. By 2007, the implied inequality-induced drag on aggregate demand that began in 1979 amounted to more than 4 percentage points of GDP every year. Even if we measure from 1989, and we take as given the large (but almost surely temporary) decline in top 1 percent income shares from 2007 to 2012, by 2012 inequality was imposing a drag of over 2 percentage points on aggregate demand growth. It is worth restating that this hit to the level of aggregate demand generated by rising inequality is cumulative: this demand drag is occurring each year by 2007 or 2012. This means that other macroeconomic influences must continuously ratchet up to keep demand growth from flatlining. We of course know one of these macroeconomic demand resuscitators—the sharp fall in the neutral interest rate. To get a sense of just how large this inequality-induced drag on aggregate demand had become before the Great Recession hit, it’s useful to compare it with well-known policy interventions. Perhaps the best-known policy effort to boost aggregate demand growth in recent decades has been the American Recovery and Reinvestment Act (ARRA) of 2009. Passed to help stem the downward spiral of the Great Recession and financial crisis, ARRA provided the largest discretionary fiscal stimulus ever provided to the American economy. Its year of peak effectiveness was 2010, when, the Congressional Budget Office (CBO 2015) estimated, it boosted aggregate demand growth (and hence GDP growth) by between 0.7 and 4.1 percentage points of GDP. This upper bound is roughly in line with the estimates above of the demand drag placed on the U.S. economy by rising inequality by 2007. This means that to fully offset the demand drag stemming from inequality using available policy tools, policymakers would need to pass the equivalent of a new ARRA each year. Of course, in the years between 1979 and 2007, other influences boosted demand as inequality sapped it. The most obvious influences were asset market bubbles in the stock and housing markets. But absent transitory (and damaging) influences like large asset market bubbles, the scale of policy intervention needed to keep aggregate demand growth constant in the face of rising inequality is absolutely huge. This decline in the NIPA savings rate needs to be wrestled with. But both theory and evidence indicate that a falling NIPA personal savings rate can be reconciled with the story of inequality tamping down demand growth. Of all the evidence, the strongest support comes from data that suggest that the NIPA personal savings rate is falling at least in part because it does not include a huge source of savings for the wealthy—unrealized capital gains. In regards to data, while a cross-sectional redistribution of income from the bottom 95 percent to the top 5 percent will unambiguously reduce savings all else being equal (holding everything else constant), in the real world it is not likely that everything else holds constant. For example, as income was shifting to the top 1 percent from 1989 to 2012, there were often periods when these households were reducing their own savings rates over time. (As Cynamon and Fazzari 2015 document and the appendix of this paper shows, savings rates of top income households are quite volatile.) If rich households perceived the shift in income toward themselves over this period as permanent, a reduction in savings would have indeed been the textbook economic response. This time-series behavior of rich households with regard to their savings rates does not change the fact that a shift of income growth between income classes has potentially large effects on demand growth. 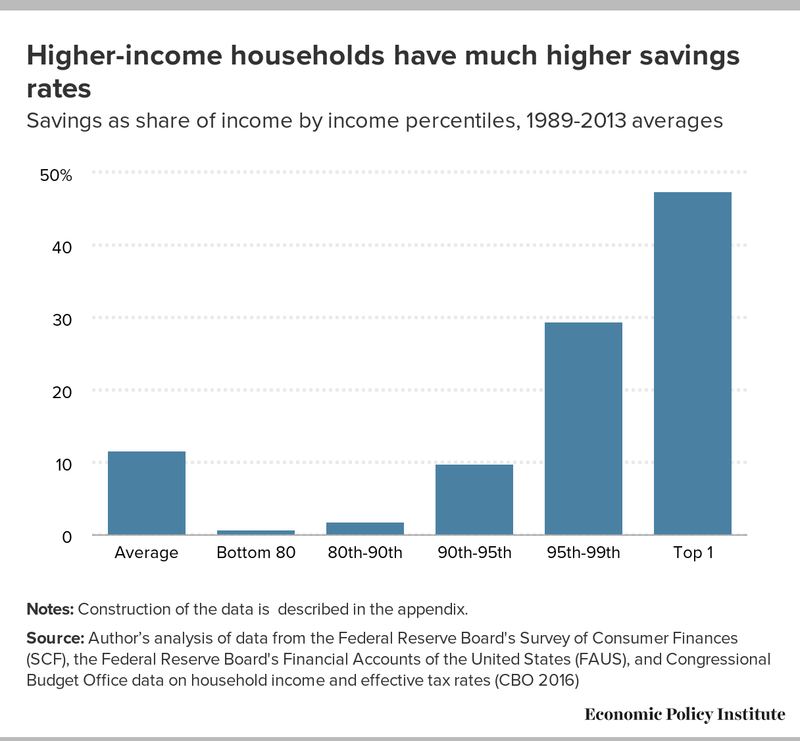 Importantly, even when looking at the lowest savings rate recorded in a single year by top 1 percent households in the Survey of Consumer Finances data between 1989 and 2016, the top 1 percent savings rate is still roughly 10 times higher than the savings rate of the bottom 80 percent. Finally, and most importantly, it is likely that much of the rise in savings from our decades-long upward redistribution of income has actually materialized as unrealized capital gains, which are not captured by the NIPA personal savings rates. Essentially, there are two ways that households accrue net wealth: they consume less than the full amount of income they earn and save the remainder, or, their stock of accumulated past savings gains in value. This gain in value of the stock of accumulated savings is a capital gain. If households sell the asset then they have “realized” this capital gain. Realized gains are captured in some income sources (such as the CBO income data we used in Table 1). But even if a household does not sell the asset as the asset’s price increases, the household has still seen an increase in wealth due to a rise in unrealized capital gains. The NIPA personal savings rate only measures savings out of current income flows—the difference between income and consumption spending in the U.S. household sector. Figure F shows the change in household net worth as a share of GDP. A broader definition of savings sometimes used by economists, this measure includes not only current income flows that are not consumed, but also the changes to wealth occurring from rising or falling asset prices, i.e., unrealized capital gains. This measure shows no obvious downward trend, although it clearly has become more volatile in recent years. 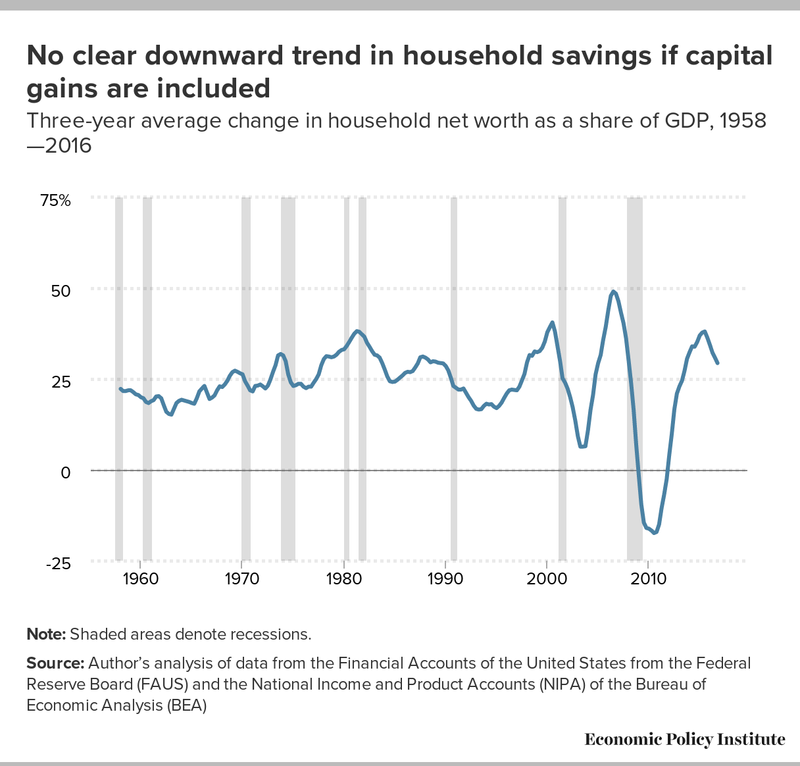 As can be inferred from this data showing no downward trend in net worth, even in the face of falling flows of savings out of current income (shown in NIPA data), capital gains have been large (larger than flows of household savings) and growing in recent decades. 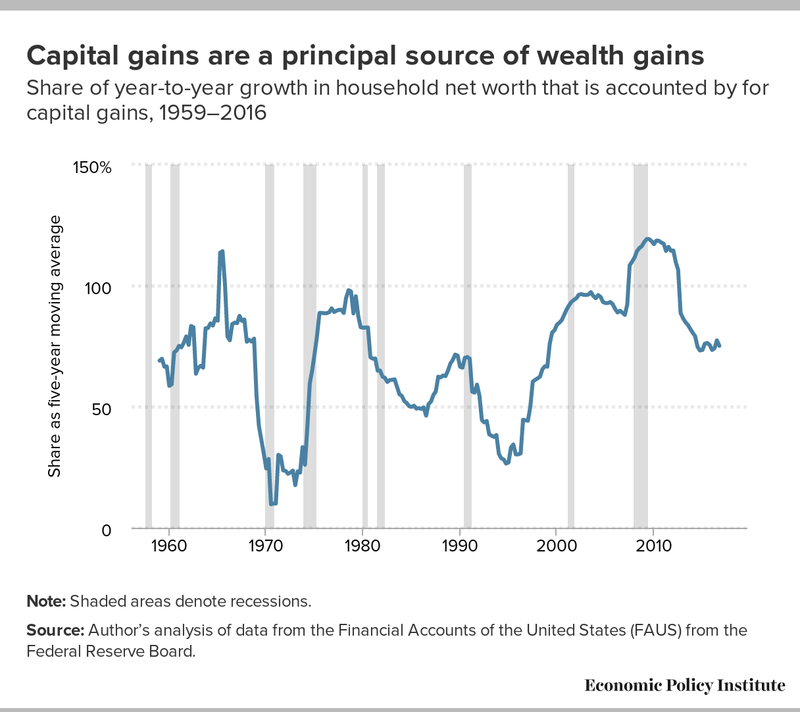 For example, as can be seen in Figure G, unrealized capital gains on financial assets constituted more than three quarters of the annual rise in household net worth on average between 1979 and 2016. The remaining quarter was contributed by household savings out of current income. Further, the rise in capital gains is likely driven by a shift in corporate strategy that has redistributed more profits to shareholding households in the form of stock repurchases and less in dividend payments (as shown in Figure H). 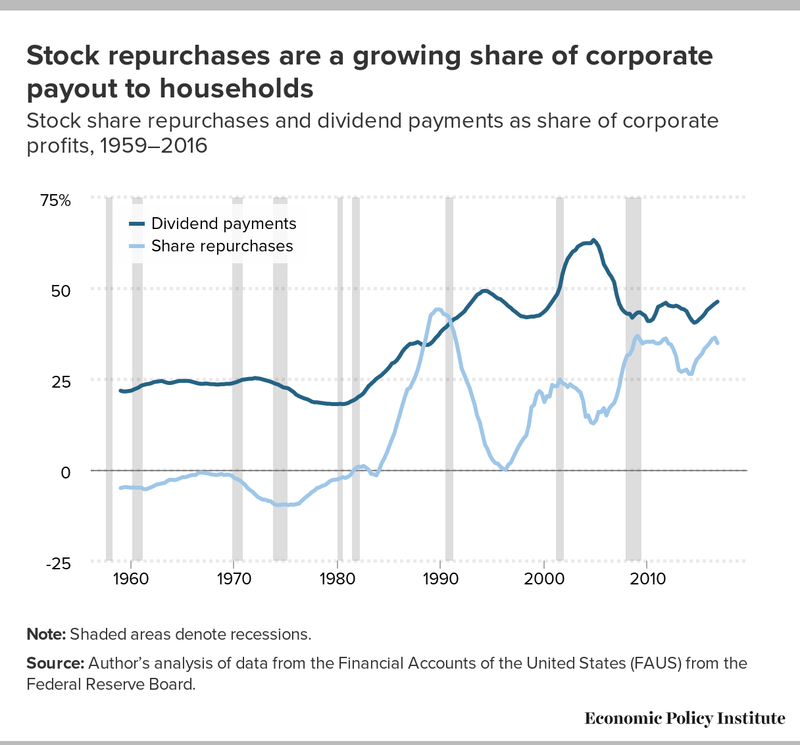 Dividends and stock repurchases are just two different methods by which corporations can return the benefits of profits to their owners (shareholders). If firms decide to repurchase their own stock, this bids up the firm’s stock price and causes a capital gain. If the firm instead decides to take money that was being used to repurchase stock and use it instead to just pay dividends to shareholders, these dividends would show up in the NIPA measure of personal income and would be captured in the personal savings rate. Capital gains, again, are not measured as personal income and hence the change in corporate strategy to emphasize share repurchases over dividend payments affects measured savings rates. In short, much savings among high-income households in recent decades has likely shown up more on corporate balance sheets than on household balance sheets. Further, the specific corporate actions—most notably the use of profits to repurchase stocks rather than pay dividends—has kept most measures of national savings from registering the pronounced increase in wealth deriving from the upward distribution of income. 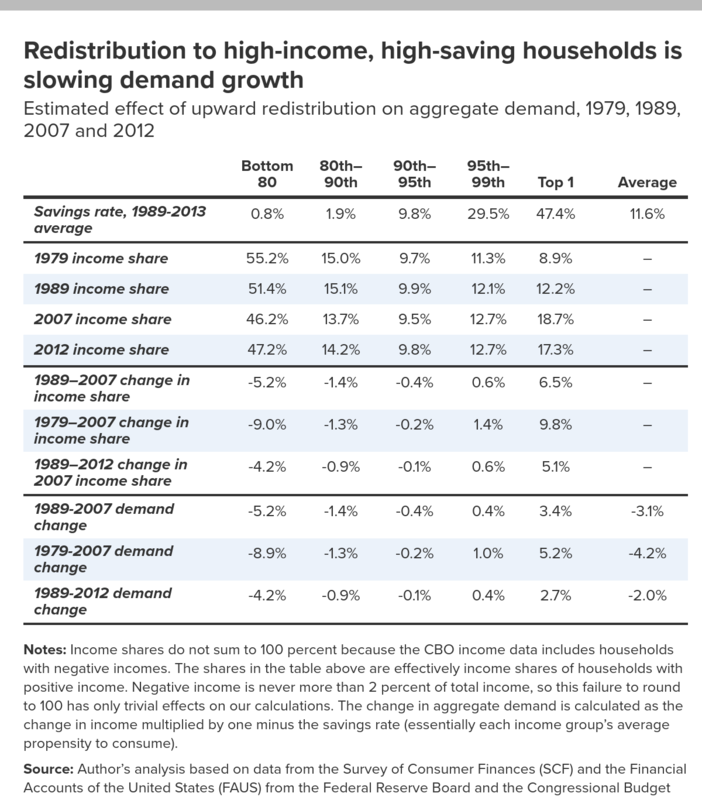 This helps explain why some measures of household savings show strong declines in recent decades even as total income claimed by high-income, high-savings households has increased dramatically: the extra savings resulting from that upward redistribution may be showing up in places besides household balance sheets. Source: Author’s analysis of data from the Financial Accounts of the United States (FAUS) from the Federal Reserve Board. Recent work has highlighted the possibility that rising inequality constitutes an exogenous shock to aggregate demand growth in the American economy. For years, this negative shock could largely be ameliorated by declining interest rates set by the Federal Reserve. But since 2000, the American economy has often found itself with a shortfall of aggregate demand even with short-term interest rates essentially at zero. This means that further increases in inequality will be damaging indeed to prospects of economic growth over the short and medium term unless some other lever of policy fills in the demand shortfall caused by the upward redistribution of income to high-saving households. Further, there is growing evidence that prolonged periods of too-low aggregate demand can damage the economy’s productive capacity. Policymakers need to get much more serious about avoiding this vicious spiral of chronic demand shortages caused in part by rising inequality degrading productive capacity. Getting serious would mean adopting a more expansionary monetary and fiscal policy portfolio (public investments and expansions to social insurance programs) than has been pursued in recent decades. But, as Taylor et al. (2015) highlight, the scale of upward redistribution of income in recent years would require historically unprecedented changes in taxes and transfers to reverse. They also note that to move the dial on aggregate demand, policy efforts to spur wage increases will have to be much more ambitious than the adjustments to the federal minimum wage in recent decades. We need to enact a much larger raise in the minimum wage and advance policies to boost wage growth for workers making substantially more than the minimum wage. This makes the EPI’s Raising America’s Pay agenda so vital. It proposes a series of policies that, together, could raise wages for American workers. Pay increases for the bottom 80 percent of households would not just raise the welfare and living standards of these families. Pay increases would also substantially loosen a binding constraint on economic growth: the chronic shortfall in aggregate demand. In short, boosting pay for America’s workers will indeed not only be good for their living standards, it would create a healthier economy overall. Josh Bivens joined the Economic Policy Institute in 2002 and is currently the director of research. His primary areas of research include macroeconomics, social insurance, and globalization. He has authored or co-authored three books (including The State of Working America, 12th Edition) while working at EPI, edited another, and has written numerous research papers, including for academic journals. He often appears in media outlets to offer economic commentary and has testified several times before the U.S. Congress. He earned his Ph.D. from The New School for Social Research. The construction of savings rates by income percentile draws heavily on methods pioneered by Maki and Palumbo (2001). Measuring savings rates at the top of the income distribution with the most-used data on consumption, income, and savings—the Consumer Expenditures Survey (CEX)—is difficult because incomes are “top-coded” to preserve confidentiality. This means that reporting on incomes above a certain threshold is suppressed, and instead a single value—the “top-code”—is given to all incomes above the threshold. Further, much recent evidence suggests that the CEX misses a large amount of consumption spending by the rich (see Aguiar and Bils 2015). Maki and Palumbo (2001) turn to the Survey of Consumer Finances to obtain better measures of savings behavior among high-income households. Besides oversampling wealthy households, the SCF also provides fine-grained income percentile rankings, allowing researchers to identify the top 1 percent of households by income. The measure of saving used by Maki and Palumbo (2001) and this paper is the net acquisition of assets. This is calculated by using the SCF to obtain the share of a particular asset that is held by a given income class. Forty percent of equities, for example, were held by the top 1 percent of income owners in 2013, while 8 percent of residential real estate was held by this top 1 percent. From this acquisition of assets, we subtract the acquisition of household debt using the same methodology. Then, the SCF shares are applied to data from the Financial Accounts of the United States on the economy-wide net acquisition of those assets by the household sector. So, in 2013, roughly $650 billion in corporate equities was acquired by the U.S. household sector. Assuming that the acquisition was proportional to the cross-sectional share held by each income group, we can measure asset acquisition by income percentile. Finally, we can divide these measures of total asset acquisition (or, savings) by data on incomes from the Congressional Budget Office dataset on effective tax rates and household incomes by percentile. Using the CBO data is one innovation of this paper, as it provides a more comprehensive measure of household income by percentile than what has been used by Maki and Palumbo (2001). Figure E in the paper reports the average savings rates by income group between 1989 and 2013. While the relative ranking of savings is apparent in each year of the data, there is substantial volatility between individual years in both average savings as well as savings by income group. Much of this volatility seems clearly linked to large movements in asset prices—the bubbles in the stock market and residential real estate markets that characterized the late 1990s and early 2000s, respectively. Figure A1 shows the estimates for each year of savings by income group. What is apparent is the large swings in savings behavior of the top 1 percent. Between 1989 and 2001, their savings rates declined substantially. From 2001 to 2004, their savings rate increased markedly. However, what is also apparent is that the rich always save orders of magnitude more than the bottom 80 percent. 1. The estimate is 2 percentage points when measuring how much the drag on demand that began in 1979 was slowing growth by 2007, 3.1 percentage points when measuring how much the drag on demand that began in 1989 was slowing growth by 2007, and 4 percentage points when measuring how much the drag on demand that began in 1979 was slowing growth by 2012. 2. In 2016 dollars, the federal minimum wage peaked in 1968 at just under $10, or about 25 percent higher than today’s federal minimum wage of $7.25. A recent proposal would raise the federal minimum to $15 by 2024, which would be roughly equivalent to $12.50 in 2016 dollars, or about 25 percent higher than the 1968 peak (Cooper 2017). 3. See Bivens (2016) for the measure of the “inequality tax.” The 20 percent refers to the peak level of this tax in 2007, and the collapse in top 1 percent incomes following the Great Recession reduced this inequality tax for a number of years. Given that most measures of inequality have begun marching upward post-2011, it seems a safe bet that the 2007 level of the inequality tax is either with us again today or will be soon. 4. This analysis focuses on the impact of inequality on demand through 2007, instead of 2012 or 2013, because top incomes by 2012 and 2013 still had not recovered from the combination of the stock and housing markets declines associated with the Great Recession. Including only the still-depressed top 1 percent shares of 2012 or 2013 in this analysis would underestimate the effect of rising inequality. The latest year we use is 2012 even though income data from 2013 does exist. We chose not to use the 2013 data because of the pronounced income-shifting for tax reasons that occurred in this year that lowered reported capital incomes. Specifically, asset holders shifted capital income realizations to 2012 to avoid some tax changes that were set to become law in 2013. To get a sense of the extent of this tax-shifting, note that the 2012 top 1 percent share of total income was 17.3 percent, a full 2.3 percentage points higher than the 15.0 percent share held by the top 1 percent in 2013. 5. As noted in Mishel et al. 2012, the rise in capital income’s share is driven overwhelmingly by a higher profit rate, not a rise in capital-output ratios. 6. This presumes, of course, that overall income growth over the period would not have been hurt by not allowing inequality to rise. This is a fair presumption, and Bivens 2016 showed that there is no evidence to support worries that a more equal distribution of income growth in the past generation would have somehow impeded average growth rates. 7. See Bivens (2017) and Ball (2014) for some empirical support for the view that prolonged demand-side weakness eventually bleeds over into serious damage to the economy’s supply side. 8. The difference between potential GDP in 2017 as projected by the CBO in 2008 and potential GDP in 2017 as estimated by the CBO in 2017 is roughly $2 trillion. If the damage inflicted by demand shortfalls that led to the Great Recession and subsequent slow recovery is responsible for a quarter of that gap, it would be $500 billion. (See Bivens 2017 and Yagan 2017 for examples of how demand weakness has bled into slower growth in potential GDP. 9. Holston, Laubach, and Williams (2016) provide a recent example of the analysis and labeling of the “falling R-star” phenomenon. 10. From a household perspective, savings (income minus consumption spending) by definition must show up as the acquisition of an asset, even if that asset is just a larger balance in a checking account. 11. We noted previously in footnote 4 why we do not use 2013 as an end-point in our analysis of incomes. The savings rates from the SCF are constructed using averages from 1989 to 2013. We use the 2013 data in this case because the SCF is only available every 3 years. 12. The dynamic where an increase in desired savings actually induces a demand-shortfall that leads to lower realized savings is well-known to macroeconomists; it has traditionally been called the paradox of thrift. In the decades before the Great Recession, it was largely thought to be a theoretical curiosity, but Eggersston and Krugman (2012) have noted that it is quite possible, particularly when the ZLB binds. Aguiar, Mark, and Mark Bils. 2015. “Has Consumption Inequality Mirrored Income Inequality?” American Economic Review vol. 105, no. 9, 2725–2756. Alichi, Ali, Kory Kantenga, and Juan Sole. 2016. “Income Polarization in the United States.” International Monetary Fund Working Paper WP/16/121. Ball, Lawrence. 2014. “Long-Term Damage from the Great Recession in OECD Countries.” National Bureau of Economic Research (NBER) Working Paper no. 20185. Bivens, Josh. 2016. Progressive Redistribution without Guilt: Using Policy Changes to Shift Economic Power and Make Incomes Grow Fairer and Faster. Economic Policy Institute. Bivens, Josh. 2017. A “High-Pressure” Economy Can Help Boost Productivity and Provide Even More “Room to Run” for the Recovery. Economic Policy Institute. Bivens, Josh, Elise Gould, Lawrence Mishel, and Heidi Shierholz. 2014. Raising America’s Pay: Why It’s Our Central Economic Policy Challenge. Economic Policy Institute. Bivens, Josh, and John Irons. 2008. A Feeble Recovery: The Fundamental Economic Weaknesses of the 2001–07 Expansion. Economic Policy Institute. Bureau of Economic Analysis (BEA). 2017. “Table 1.1.6. Real Gross Domestic Product, Chained Dollars.” National Income and Product Accounts. Accessed October, 2017. Bureau of Economic Analysis (BEA) National Income and Product Accounts. 2017, Table 2.1 Accessed Accessed October 2017. Congressional Budget Office (CBO). 2008. The Budget and Economic Outlook: Fiscal Years 2008 to 2018. Congressional Budget Office (CBO). 2015. Estimated Impact of the American Recovery and Reinvestment Act on Employment and Economic Output in 2014. Congressional Budget Office (CBO). 2016. The Distribution of Household Income and Federal Taxes, 2013. Congressional Budget Office (CBO). 2017. The Budget and Economic Outlook: 2017 to 2027.
Cooper, David. 2017. Raising the Minimum Wage to $15 by 2024 Would Lift Wages for 41 Million American Workers.Economic Policy Institute. Cynamon, Barry, and Steven Fazzari. 2015. “Rising Inequality, Demand, and Growth in the U.S. Economy.” Working Paper. Eggertsson, Gauti, and Paul Krugman. 2012. “Debt, Deleveraging, and the Liquidity Trap: A Fisher-Minsky-Koo Approach.” Quarterly Journal of Economics vol. 127, no. 3, 1469–1513. Federal Reserve Board. Various years. Financial Accounts of the United States. Tables B.103, R. 103, F.101, and L.6. Federal Reserve Board. Various years. Survey of Consumer Finances. Microdata. Holston, Kathryn, Thomas Laubach, and John Williams. 2016. “Measuring the Natural Rate of Interest: International Trends and Determinants.” Working Paper 2016-11. Federal Reserve Bank of San Francisco. Krugman, Paul. 2013. “Secular Stagnation, Coalmines, Bubbles and Larry Summers.” New York Times, November 16. Mishel, Lawrence, Josh Bivens, Elise Gould, and Heidi Shierholz. 2012. The State of Working America, 12th Edition. An Economic Policy Institute book. Ithaca, N.Y.: Cornell Univ. Press. Rachel, Lukasz, and Thomas Smith. 2015. “Secular Drivers of the Real Interest Rates.” Bank of England Staff Working Paper no. 571. Summers, Lawrence. 2016. “The Age of Secular Stagnation.” Foreign Affairs, February. Taylor, Lance, Armon Rezai, Rishabh Kumar, N.H. Barbosa-Filho, Laura Carvalho. 2015. “Wage Increases, Transfers, and the Socially Determined Income Distribution in the USA.” Working Paper, Institute for New Economic Thinking (INET). Yagan, Danny. 2017. “Employment Hysteresis from the Great Recession.” National Bureau of Economic Research (NBER) Working Paper no. 23844.